An FAA airframe and powerplant (A&P) technician is not qualified to do internal maintenance on instruments and related line replaceable units. This must be carried out at facilities equipped with the specialized equipment needed to perform the maintenance properly. Qualified technicians with specialized training and intimate knowledge of instruments perform this type of work, usually under repair station certification. However, licensed airframe technicians and A&P technicians are charged with a wide variety of maintenance functions related to instruments and instrument systems. Installation, removal, inspection, troubleshooting, and functional checks are all performed in the field by licensed personnel. It is also a responsibility of the licensed technician holding an airframe rating to know what maintenance is required and to access the approved procedures for meeting those requirements. In this page various maintenance and servicing procedures and suggestions are given. The discussion follows the order in which the various instruments and instrument systems were presented throughout this page. This is not meant to represent all of the maintenance required by any of the instruments or instruments systems. The aircraft manufacturer’s and instrument manufacturer’s approved maintenance documents should always be consulted for required maintenance and servicing instructions. FAA regulations must also be observed. When an aircraft is to be operated under IFR, an altimeter test must have been performed within the previous 24 months. Title 14 of the Code of Federal Regulations (14 CFR) part 91, section 91.411, requires this test, as well as tests on the pitot static system and on the automatic pressure altitude reporting system. The licensed airframe or A&P mechanic is not qualified to perform the altimeter inspections. They must be conducted by either the manufacturer or a certified repair station. 14 CFR part 43, Appendixes E and F detail the requirements for these tests. Water trapped in a pitot static system may cause inaccurate or intermittent indications on the pitot-static flight instruments. This is especially a problem if the water freezes in flight. Many systems are fitted with drains at the low points in the system to remove any moisture during maintenance. Lacking this, dry compressed air or nitrogen may be blown through the lines of the system. Always disconnect all pitot-static instruments before doing so and always blow from the instrument end of the system towards the pitot and static ports. This procedure must be followed by a leak check described below. Systems with drains can be drained without requiring a leak check. Upon completion, the technician must ensure that the drains are closed and made secure in accordance with approved maintenance procedures. Aircraft pitot-static systems must be tested for leaks after the installation of any component parts or when system malfunction is suspected. It must also be tested every 24 months if on an IFR certified aircraft intended to be flown as such as called out in 14 CFR section 91.411. Licensed airframe and A&P technicians may perform this test. The method of leak testing depends on the type of aircraft, its pitot-static system, and the testing equipment available. [Figure 1] Essentially, a testing device is connected into the static system at the static vent end, and pressure is reduced in the system by the amount required to indicate 1,000 feet on the altimeter. Then, the system is sealed and observed for 1 minute. A loss of altitude of more than 100 feet is not permissible. If a leak exists, a systematic check of portions of the system is conducted until the leak is isolated. Most leaks occur at fittings. The pitot portion of the pitotstatic system is checked in a similar fashion. Follow the manufacturer’s instructions when performing all pitot-static system checks. In all cases, pressure and suction must be applied and released slowly to avoid damage to the aircraft instruments. Pitot-static system leak check units usually have their own built-in altimeters. This allows a functional cross-check of the aircraft’s altimeter with the calibrated test unit’s altimeter while performing the static system check. However, this does not meet the requirements of 14 CFR section 91.411 for altimeter tests. Upon completion of the leak test, be sure that the system is returned to the normal flight configuration. If it is necessary to block off various portions of a system, check to be sure that all blanking plugs, adaptors, or pieces of adhesive tape have been removed. Tachometer indicators should be checked for loose glass, chipped scale markings, or loose pointers. The difference in indications between readings taken before and after lightly tapping the instrument should not exceed approximately 15 rpm. This value may vary, depending on the tolerance established by the indicator manufacturer. Both tachometer generator and indicator should be inspected for tightness of mechanical and electrical connections, security of mounting, and general condition. For detailed maintenance procedures, the manufacturer’s instructions should always be consulted. When an engine equipped with an electrical tachometer is running at idle rpm, the tachometer indicator pointers may fluctuate and read low. This is an indication that the synchronous motor is not synchronized with the generator output. As the engine speed is increased, the motor should synchronize and register the rpm correctly. The rpm at which synchronization occurs varies with the design of the tachometer system. If the instrument pointer(s) oscillate(s) at speeds above the synchronizing value, determine that the total oscillation does not exceed the allowable tolerance. Pointer oscillation can also occur with a mechanical indication system if the flexible drive is permitted to whip. The drive shaft should be secured at frequent intervals to prevent it from whipping. When installing mechanical type indicators, be sure that the flexible drive has adequate clearance behind the panel. Any bends necessary to route the drive should not cause strain on the instrument when it is secured to the panel. Avoid sharp bends in the drive. An improperly installed drive can cause the indicator to fail to read or to read incorrectly. The compass indicator should be checked for correct readings on various cardinal headings and recompensated if necessary. Moving parts of the compass should work easily. The compass bowl should be correctly suspended on an antivibration device and should not touch any part of the metal container. The compass bowl should be filled with liquid. The liquid should not contain any bubbles or have any discoloration. The scale should be readable and be well lit. Figure 2. A magnetic compass with a deviation correction card attached, on which the results of swinging the compass should be recorded. There are various ways to swing a compass. The following is meant as a representative method. 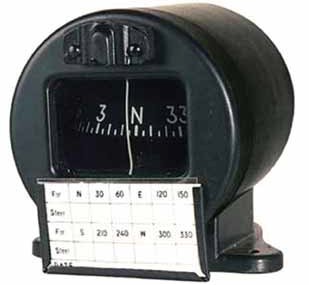 Follow the aircraft manufacturer’s instructions for method and frequency of swinging the magnetic compass. This is usually accomplished at flight hour or calendar intervals. Compass calibration is also performed when a new electric component is added to the cockpit, such as a new radio. A complete list of conditions requiring a compass swing and procedure can be found in FAA Advisory Circular (AC) 43.13-1 (as revised), Chapter 12-37. The aircraft should be in level flight attitude for the compass swing procedure. Tail draggers need to have the aft end of the fuselage propped up, preferably with wood, aluminum, or some other nonferrous material. The aircraft interior and baggage compartments should be free from miscellaneous items that might interfere with the compass. All normal equipment should be on board and turned on to simulate a flight condition. The engine(s) should be running. The basic idea when swinging a compass is to note the deviation along the north-south radial and the east-west radial. Then, adjust the compensating magnets of the compass to eliminate as much deviation as possible. Begin by centering or zeroing the compass’ compensating magnets with a non-ferrous screw driver. Align the longitudinal axis of the aircraft on the N-S radial facing north. Adjust the N-S compensating screw so the indication is 0°. Next, align the longitudinal axis of the aircraft on the E-W radial facing east. Adjust the E-W compensating screw so that the compass indicates 90°. Now, move the aircraft to be aligned with the N-S radial facing south. If the compass indicates 180°, there is no deviation while the aircraft is heading due north or due south. However, this is unlikely. Whatever the southfacing indication is, adjust the N-S compensating screw to eliminate half of the deviation from 180°. Continue around to face the aircraft west on the E-W radial, and use the E-W compensating screw to eliminate half of the west-facing deviation from 270°. 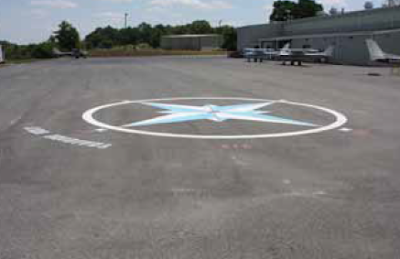 Once this is done, return the aircraft to alignment with the N-S radial facing north and record the indication. Up to 10° deviation is allowed. Align the aircraft with the radials every 30° around the compass rose and record each indication on the compass compensation card. Date and sign the card and place it in full view of the pilot near the compass in the cockpit. Errors in the indication presented on a vacuum gyroscopic instrument could be the result of any factor that prevents the vacuum system from operating within the design suction limits. Errors can also be caused by problems within the instrument, such as friction, worn parts, or broken parts. Any source that disturbs the free rotation of the gyro at design speed is undesirable resulting in excessive precession and failure of the instruments to maintain accurate indication. The aircraft technician is responsible for the prevention or correction of vacuum system malfunctions. Usually this consists of cleaning or replacing filters, checking and correcting insufficient vacuum, or removing and replacing the vacuum pump or instruments. 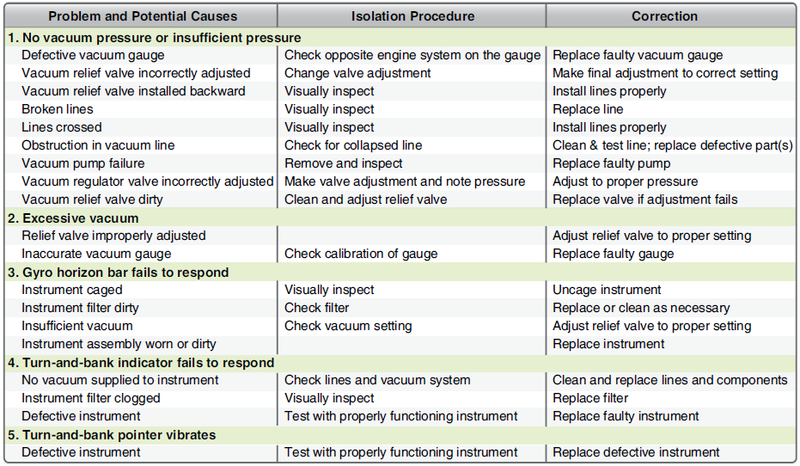 A list of the most common malfunctions, together with their correction, is included in Figure 4. The information in this page does not apply to any particular autopilot system, but gives general information that relates to all autopilot systems. Maintenance of an autopilot system consists of visual inspection, replacement of components, cleaning, lubrication, and an operational checkout of the system. Consult the manufacturer’s maintenance manual for all of these procedures. With the autopilot disengaged, the flight controls should function smoothly. The resistance offered by the autopilot servos should not affect the control of the aircraft. The interconnecting mechanisms between the autopilot system and the flight control system should be correctly aligned and smooth in operation. When applicable, the operating cables should be checked for tension. An operational check is important to assure that every circuit is functioning properly. An autopilot operational check should be performed on new installations, after replacement of an autopilot component, or whenever a malfunction in the autopilot is suspected. After the aircraft’s main power switch has been turned on, allow the gyros to come up to speed and the amplifier to warm up before engaging the autopilot. Some systems are designed with safeguards that prevent premature autopilot engagement. While holding the control column in the normal flight position, engage the autopilot system using the switch on the autopilot controller. Rotate the turn knob to the left; the left rudder pedal should move forward, and the control column wheel should move to the left and slightly aft. Rotate the turn knob to the right; the right rudder pedal should move forward, and the control column wheel should move to the right and slightly aft. Return the turn knob to the center position; the flight controls should return to the level-flight position. Rotate the pitch-trim knob forward; the control column should move forward. Rotate the pitch-trim knob aft; the control column should move aft. If the aircraft has a pitch-trim system installed, it should function to add down-trim as the control column moves forward and add up-trim as the column moves aft. Many pitch-trim systems have an automatic and a manual mode of operation. The above action occurs only in the automatic mode. Check to see if it is possible to manually override or overpower the autopilot system in all control positions. Center all the controls when the operational checks have been completed. Disengage the autopilot system and check for freedom of the control surfaces by moving the control columns and rudder pedals. Then, reengage the system and check the emergency disconnect release circuit. The autopilot should disengage each time the release button on the control yoke is actuated. When performing maintenance and operational checks on a specific autopilot system, always follow the procedure recommended by the aircraft or equipment manufacturer. Electronic and digital instrument systems utilizing LCD technology may have special considerations for the care of the display screens. Antireflective coatings are sometimes used to reduce glare and make the displays more visible. These treatments can be degraded by human skin oils and certain cleaning agents, such as those containing ammonia. It is very important to clean the display lens using a clean, lint-free cloth and a cleaner that is specified as safe for antireflective coatings, preferable one recommended by the aircraft manufacturer.